OnlinePassportPhotos is pleased to announce to the extension of our revolutionary online Passport Photo services for Germany Visa and Passport photos. We know how difficult it is to get non-standard size passport photos taken in the USA so we are very pleased to announce the availability of passport photos for Germany Passport or Visa delivered directly to your home. Note: You can also get them usually within 24 hours by either selecting an option to pick at your local Walgreens store or by asking us to e-mail passport photos in a 4x6 print format that you can take to any photo lab or store and get printed yourself. Thank you so much. I was in need of German passport pictures and unable to find a place that could provide them to me. I found you online and after a few promptly answered questions, less than 2 hours after placing the order the pictures were available to me. You took a big worry off my mind and I would recommend your services to anyone needing passport pictures. The service was fast, convenient and superb quality. 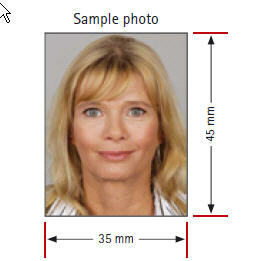 The Germany Visa photo must clearly show the person's facial features from the bottom of the chin to the crown (the top of the head, not the top of the hair) as well as the left and right sides of the face. The face must take up 70%- 80% of the German Visa picture. This corresponds to a height of 32 - 36mm. Because it is often difficult to determine where the top of the head would be without hair, photos should be rejected only if the face measures less than 27mm or more than 40mm. In the case of voluminous hairstyles, the entire head (including hair) must be visible without reducing the size of the face, if possible. The face must be centred in the photo. The background must be one colour and bright (ideally a neutral grey colour) and in a contrasting colour to the face and hair. In the case of light-coloured hair, a medium-grey background is suitable whilst a light-grey background is suitable for dark hair. The background must not be patterned. The photo must show only the person to be photographed (no other persons or objects in the photo). Shadows on the background are not acceptable. The photo must be printed on high-quality paper with a print resolution of at least 600 dpi (especially when taken with a digital camera). Colour photos must have proper colour balance and reproduce natural skin tones. The photo must be clean, undamaged and free of creases. Photos may be in black and white or in colour. The head of the person photographed should be neither tilted nor turned (portrait style). The facial expression must be neutral with the mouth closed and looking directly at the camera. Can Glasses be worn for GERMAN VISA PICTURES? Eyes must be clearly visible (no flash reflection off the lenses, no tinted lenses or sunglasses). The edge of the lenses or frames should not cover any part of the eyes. Hats or head coverings are not permitted; exceptions may be made, in particular for religious reasons. If a head covering is allowed, the face must be visible from the bottom of the chin to the forehead. Shadows on the face are not acceptable. For children aged 9 and under, the following requirements apply: The face should take up 50 ¡V 80% of the photo. This means that the face from the bottom of the chin to the crown (the top of the head, not the top of the hair) should measure between 22 and 36mm. Because it is often difficult to determine where the top of the head would be without hair, photos should be rejected only if the face measures less than 17mm or more than 40mm. See below for special requirements in the case of babies and very young children. Children aged 5 and under do not need to have a neutral expression or look directly at the camera, and their heads do not have to be centred in the photo. Babies under one year do not have to have their eyes open. Information taken from Germany Info website. We are not responsible for accuracy or current-ness of the information. Please contact German Consulates for most currrent details about German Visa Photo size and Germany Visa Picture dimensions.